This note is prompted by the untoward and unfortunate events surrounding the death of a young man, Kevin, as a consequence of his marrying a girl, Neenu, against the explicit wishes of her parents. The tragic story about the brutal killing and the vengeance behind it were highlighted by the media. Unlike in the past, more and more young men and women are choosing their partners, with or without the consent of their parents. This phenomenon, in the traditional scheme of things,hasledto a lot of stress and strain in the family system. Owing, in part, to socio-economic developments, there have been significant changes in our lifestyle, including in the matter of marriage. Our young people move in a fast-paced, technology driven world. Our youth go to far-away places to build careers and lives. This new-found freedom in a totally new terrain prompts some to look for love and friendship outside the family. Whereas the parental system is not yet open to new choices and outlooks, there is a real need for dialogue and resolution between the member and the rest of the family. Besides, there is a strong family bond among Asian families, leading to a family ego, over and above the individual ego. Love and romance are real and society needsto take a second look at the whole thing. The time is ripe for families to introspect abouthow children are loved and cared for, and how they are gradually equipped to enter married lives. How you give and take love is greatly influenced by two significant people in your life: your parents. Our first experience with love is with our parents, and those early years set the bar for how we see, give, and receive love, and what we want from relationships later in our lives. How parents loved and how they expressed love towards the child is significant. Equally important is the way how anger and conflict were managed in the family. There are constructive and destructive ways of handling conflicts and the child buildsa style of communication and relationships by observation and direct experience of our primary role models. · Young people who have had an insecure attachment development with their parents in childhood tend to seek ‘secure’ attachments indiscriminately. In the absence of attachment and early bonding, they develop a fragmented sense of self which may lead to low self-esteem, anxiety in relationships, doubt about their acceptability, and so on. Such low self-esteem and anxiety may lead to great compromise in selecting a partner. · As a result of continued, inappropriate emotional responses from either or both the parents, children undergo emotional abuse, and later in life manifest a sense of worthlessness and helplessness. This attitude of “I am not OK”, leads such individuals to great compromises in selecting a lifepartner. · Unhealthy parenting such as frequent appeasement of one or more family members due to their birth order, gender, age, and abilities greatly affect the family emotional ecosystem. This behaviour implies the frequent appeasement of one member at the expense of others andinconsistent enforcement of rules. As a result, the aggrieved members show abnormally high levels of jealousy and distortion. 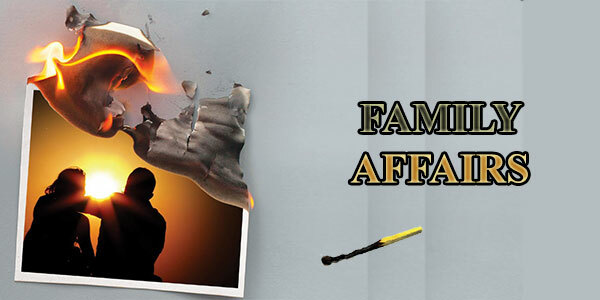 For such unhappy members an affair becomes a medium to disconnect from the family of origin and find an escape route. · Dysfunctional families contribute to unhealthy affairs in many ways. In such families, there is likely to occur misbehaviour from the part of the parents in the form of child neglect or abuse, occurring continuously and regularly. Besides, parental conflicts are handled in an unhealthy manner, often resulting in physical and mental violence. Growing up in such an unhealthy ecosystem can be so traumatic that such a member will be prompted to get away at the earliest chance. Bowen calls this unhealthy ecosystem, “Undifferentiated Family Ego Mass” (Bowen M.). An affair becomes a catalyst in this escape process to freedom! · Daughters of emotionally divorced parents have been shown to deal with the absence of a father figure by searching for male companions.They have been shown to exhibit higher levels of promiscuity and desirous of more relationships than males from divorced families (Cooney, 1994). Our life and lifestyles are fast changing due in part to socio-economic factors, technology, and globalisation. This will bring in, in fact, it has, paradigm shifts in the institutions of family and marriage. How to prepare our young generation for a healthier selection of life partners is a great challenge. In the meantime, we can do some homework about parenting and healthy living, founded on healthy family values. Licensed clinical psychologist, BET-MRT, Jeevas Centre, Aluva, Kerala.